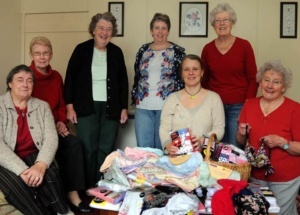 In September the WI Committee of Leedstown in Cornwall held a fund raising coffee morning and collected over 600 items of underwear while having Pantastic fun as well. Thanks to everyone for their support, including Liz Speirs (centre front) and Sheila Gold (front right) for getting in touch and sending the parcels. © Smalls for All ® 2019. Smalls for All ® is a Scottish Charitable Incorporated Organisation (SCIO) Registered in Scotland (No. SC041689). Registered office: 108 Buchanan Crescent, Eliburn, Livingston, EH54 7EF. United Kingdom.